See our guide how to get Free Lourdes water: the quickest and the cheapest way. 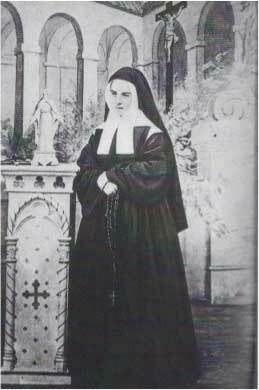 St. Bernadette entered the Sisters of Charity of Nevers in 1866 as she wanted to dedicate her life to religion. She worked in the convent hospital even though she suffered illness herself including asthma and tuberculosis. 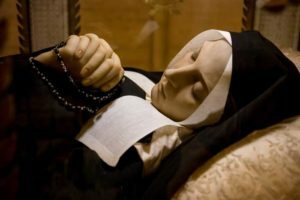 St. Bernadette died in 1879 after spending 13 years in the convent of St. Gildard. In 1925 her body was exhumed and was found to be incorrupt. It is now in a crystal coffin in the convent chapel. 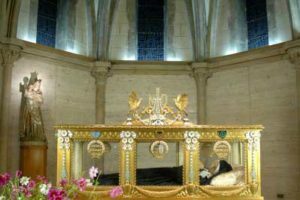 Since 3rd August 1925, following her beatification, Bernadette’s body lies in a glass shrine in the chapel of the convent of Saint- Gildard in Nevers. Bernadette’s body, when exhumed for the process of beatification, was found to be intact, to the surprise of those present. See Top 15 Catholic shrines around the world. Built on the ruins of Saint Gildard’s Abbey, this simple and bright chapel was consecrated in 1856 when the community of the Sisters of Charity of Nevers moved into this new building. 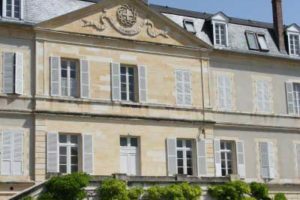 The museum highlights the various steps in Bernadette’s life: the cachot, the grotto, Hospice of Lourdes and her time in Nevers. Some photographs and artefacts depict her daily life. 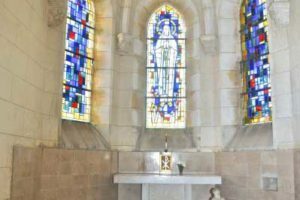 See other Catholic sites in France. Bernadette died at the age of 35 in the infirmary, which is now Holy Cross Oratory. 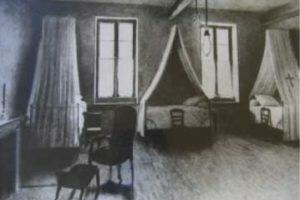 During her thirteen years at Saint Gildard, she served as assistant-nurse, head-nurse and sacristan during which time she was often ill.
On 7th July 1866, Bernadette Soubirous accompanied by the Superior of Lourdes and two other young girls, crossed the threshold of the Motherhouse in Nevers. Engraved in stone, above the entrance, the words ‘Deus Charitas Est’ which Bernadette would have seen, describe the spirit of the Congregation since its foundation. A cloister, with huge glass windows, overlooks the flowerbeds. Its sunlit corridors lead to lounges, reading rooms, conference rooms and dining rooms. Here in July 1866, wearing her Pyrenean costume, Bernadette told the story of the apparitions for the last time to 300 Sisters. 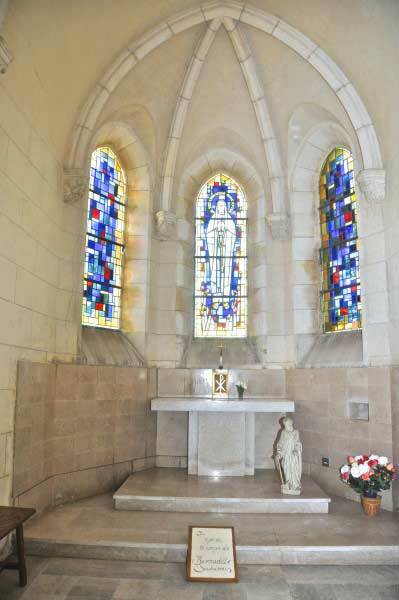 Bernadette Soubirous died on 16th April, 1879 and was interred in this chapel for 40 years. The chapel is located in the middle of the sanctuary gardens, at the end of an avenue lined with beautiful lime trees. This ‘gite’ is situated in the gardens and detached from the Sanctuary. It is wheelchair accessible and can accommodate up to 15 people. It is made available to pilgrims en route to St. James of Compostella, also to hikers. Wednesdays and Fridays at 8.00 a.m. and 11.45 a.m. If you have a priest in your group, your leader must reserve the place and time of your Mass. 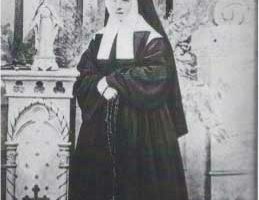 On January 7th 1844, Bernadette Soubirous was born in Lourdes, a small town in the Pyrenean mountains, to a miller’s family who enjoyed relative prosperity during the early years of Bernadette’s life. In 1858 the Apparitions began for Bernadette. On 11th February 1858, 14-year-old Bernadette Soubirous left the Cachot with her sister and a friend to collect firewood on the banks of the Gave at Massabielle. Between February and July, the Virgin Mary appeared 18 times to Bernadette. She remained in the infirmary for long periods. She suffered greatly from a knee tumour and lung tuberculosis. She died on 16th April 1879, at the age of 35 and was buried in Saint Joseph’s Chapel in the centre of the garden. On 8th December 1933, she was canonised and declared saint. In the 19th century, the reconstituted Congregation of the Sisters of Charity of Nevers attracted a substantial number of novices. The old Convent of the Visitation where the Sisters had been living, no longer met their requirements so they were obliged to seek accommodation elsewhere. 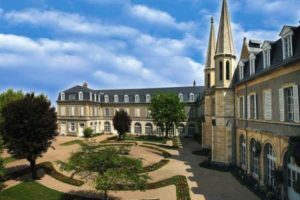 So the Bishop of Nevers, Monsignor Dufetre proposed building on a site near the town, on a hill – an ancient place of worship where nothing remained except a church with a wine press. 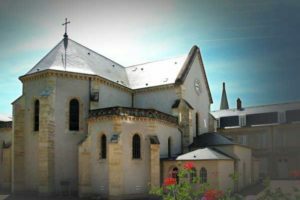 The origin of the sanctuary on the hill (Saint-Gildard) dates back to the Middle Ages. Monks had settled there and a priory was built – possibly at the end of the 7th or the beginning of the 8th century. 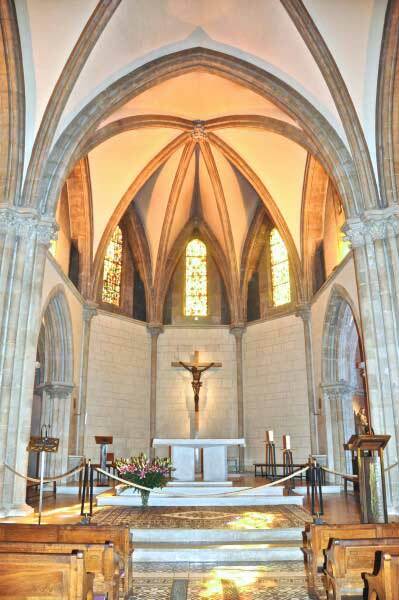 It was consecrated to Saint Loup, a deacon who had converted the Lord of the nearby town of La Charite. Very quickly the name of Saint Gildard was associated with that of Saint Loup. Saint Gildard was a priest who had particular influence on the parishioners of Lurcy-le-Bourg where he ministered. After his death his body was transferred to the priory church. The number of miracles increased, attracting crowds of people. Only the name of Saint Gildard remained as a reference to this abbey, situated one kilometre outside the walls of the town and surrounded by vineyards. By the 19th century, almost nothing remained of the original priory and church except three bays of the nave and two portals to the south and the west. 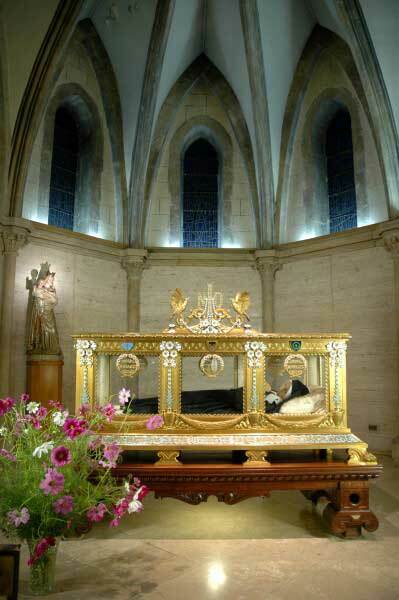 The incorrupt body of St. Bernadette Soubirous, visionary from Lourdes, France. 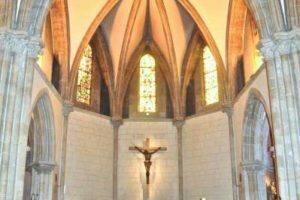 Coming to Nevers means coming to meet Bernadette Soubirous and be influenced by her and by the message she received in Lourdes and lived out in Nevers. 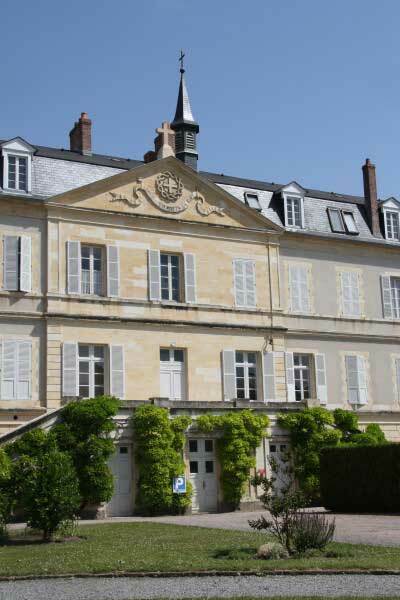 A team of employees and volunteers (lay people, priests, Sisters of Charity of Nevers), will welcome you to this Sanctuary and help you during your stay. This pilgrimage enables you to discover Bernadette through the significant places in the house and the important events which marked her life. A guided visit to the Grotto, the main Gate and the Façade! Afterwards, time to share your experience, using a specially prepared set of questions. 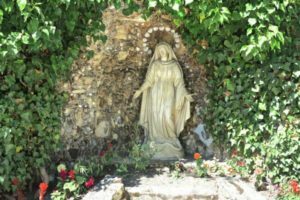 A guided visit to the garden at the back of the Chapel, the Novitiate and Our Lady of the Waters! Afterwards, time to share your experience, using a specially prepared set of questions. A guided visit to St. Joseph’s Chapel, Holy Cross Oratory and the main Chapel. The visit will be followed by free time. The pilgrimage ends with a time for sharing. Please note that the “Walk in the Footsteps of Bernadette” can be effected in one stage. Presentation of a 25-minute documentary. Based on information from the archives, this documentary takes us into Bernadette’s world and her encounter with Mary, where we follow her on her spiritual journey from Lourdes to Nevers. The film can be an introduction to the “Walk in the Footsteps of Bernadette” or it can help you bring together what you have discovered about the life of the saint. After the documentary, a time for spontaneous sharing is suggested. Your organizer/group leader will guide you to the museum. The expression on Bernadette’s face, as you enter the museum, invites you to look at the world and its people in a different light. The museum, designed as a journey, helps you to discover the life of Bernadette. 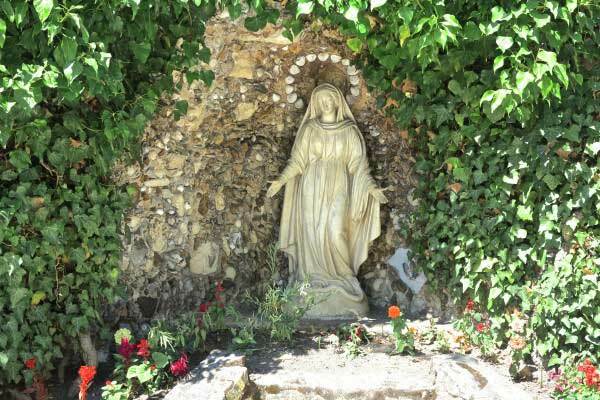 It retraces the various places connected with her – the cachot, the grotto, the hospice in Lourdes and her life in Nevers. 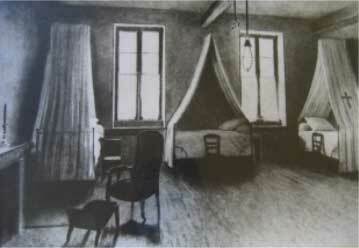 Photographs and objects depict Bernadette’s various activities during the thirteen years spent in Nevers. 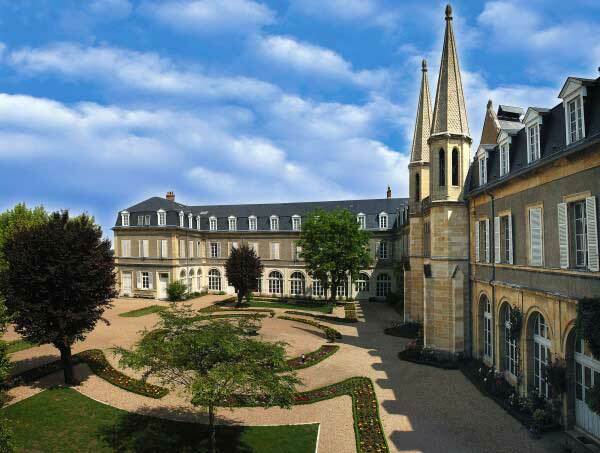 Sanctuary of Bernadette Soubirous is located in the centre of Nevers, on a hill not far from the River Loire, 600 metres from the railway station, the former Palace of the Dukes of Nevers and the Cathedral.